An RGB Guide For Making Your Retro Consoles All Look Their Best! NOTE: THIS GUIDE IS NOT YET COMPLETE IN THIS ONE POST! THERE IS PLENTY MORE TO KNOW AND I'M JUST GETTING STARTED! CHECK BACK IN LATER POSTS FOR MORE INFO! Hello AtariaAge! This is a guide I've wanted to put together for a while about getting the best possible image (and audio!) quality from all of your retro consoles, including Nintendo, Atari, Sega, Sony, Microsoft, and even other consoles like the Colecovision, TG-16/PCE, Neo Geo, and Intellivision! IMHO one of the coolest things about collecting games today is the fact that we can experience them better now than we did years ago with the new technology available to consumers via the magic of the internet. If you've ever wanted to make your games look amazing on real hardware, this is the guide for you! Check out this comparison! It is truly stunning to see. For starters, you need to understand the issue non-HD consoles present: to plug into the largest amount of standard consumer televisions, all consoles from the Atari 2600 all the way until the Wii were packaged with either a Coaxial RF (Radio Frequency) cable or composite RCA cables. These pack all of the audio and video into one and three cables respectively. The video is condensed and is ruined before it even reaches your TV. However, with the power of better cables many systems can output superior quality right out of the box! Take the SNES (non-mini) for example. It can output a superior Video signal! Check out this comparison! Here it is! The glory of RGB! However, you may have already noticed an issue here: even if your console does output a superior signal like S Video, RGB, Component, or VGA, how do you display it? Like I said no American TVs had SCART inputs ever. Also, what about systems that don't output anything anything above RF, let alone RGB, like the Atari 2600 and ColecoVision? Don't worry, there's much more to come very soon! This is just a teaser post for anyone who hasn't been lucky enough to see the glory of RGB and retro consoles looking their best. Once solution available on some classic systems like the TI-99/4A, ColecoVision, Adam Computer, MSX1 and now even the Apple II and others is the F18A VGA board. It's a direct plug-in replacement for those systems that originally used the 9918 VDP. VGA looks AWESOME on a classic system. Here's a youtube channel where they are mostly exploring the Framemeister, but they've also gone over some various console testing to show how to get the best possible picture. It almost ALWAYS comes down to the Framemeister and RGB, but sometimes they find some other ways that might be a bit cheaper. I would also highly recommend this eBay seller if you take the Framemeister route. There are other sites that sell the kind of cable you'd need, but these are incredible quality and well worth the cost. Very much agree with the above post! MLIG is amazing and informative. I've learned a lot from them. A good resource for this kind of info is RetroRGB. We're so spoiled now, compared to when these consoles first came out. I remember playing my systems via RF with several RF adapters hooked together to the one coaxial input on the back of my TV. I even remember playing my TurboGrafx hooked up to my tiny black-and-white PXL 2000 TV. I don't think I even got to use composite until the late '90s. Now, most of my systems are modded to output RGB or S-video. No more blurry or fuzzy images. RetroRGB is probably the best source, great info and comparisons on there. I suspect the OP already knows about that site as he lifted their images and used them in his post. We didn't really know better when we were kids, even TV via an antenna didn't always look great so we didn't expect video games to be any different I guess. It didn't affect the amount of fun, the NES was still a blast even only using RF. I can't remember when I first used s-video, but that was the first eye opener for me, now I use RGB as much as possible with an XRGB device. Back in the day, nobody I knew used S-video or RGB. It was RF, and later, composite. We never had problems with it. I don't think anybody even had televisions equipped with S-video, RGB, or any of those other things, nor did anyone think to try to hook them up to any kind of computer monitor that might have supported them. I always used S-Video when I could back in the very early 90's. I thought it was unbeatable until I discovered RGB. As a kid, I'd always wondered what those other fancy outputs on the side of my NES were. I figured they were for future use, like the data port thingy hidden on the bottom. Like chicgamer mentioned, we did the same thing where we would just daisy chain RF adaptors to the back of the tv. Yuck! 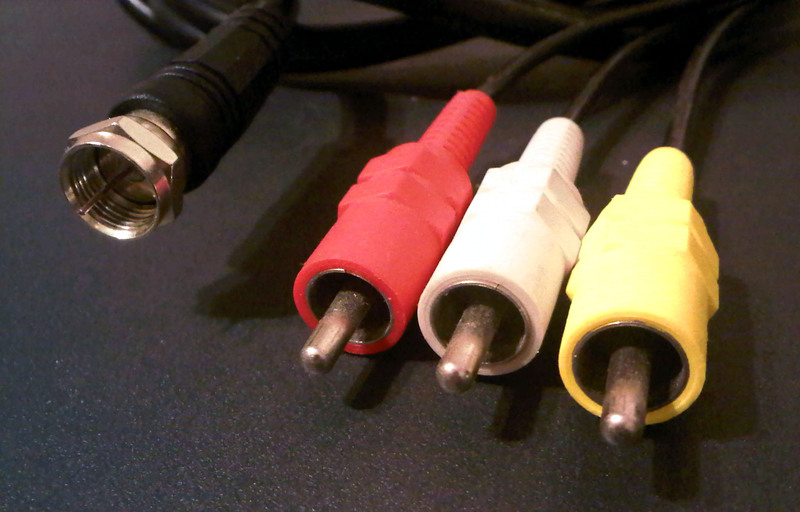 My first eye-opener was buying an S-video cable for the Dreamcast, which my new tv at the time supported. It knocked my socks off. "Look, you can actually READ the text!" I got a component-scart converter for my anniversary last August, and since then have been getting SCART cables for the systems I own that use em. So far I've got Genesis, Saturn, Master System, SNES and Neo Geo covered, plus a special turbobooster from db electronics to use the Genesis cable on the Turbografx. I'm not super big on getting some big mods done to the systems that can't do RGB stock, but I wouldn't mind getting my spare 2600 modded at some point (and maybe a spare NES). 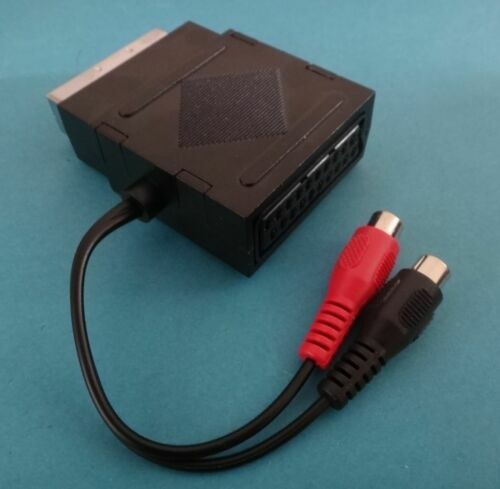 How expensive is an SCART to component adapter? I saw what looks like a straight through connector on eBay for four dollars, but I'm not sure it'd work. I'm not sure what you mean by a strait through connector. As I've seen it scart to components adapters are about 40-50 dollars, plus you need a scart to composite adapter for audio, but that's under 5 dollars so it's not a big deal. Hope this helps! Because most SCART to component or VGA adapters don't do audio, you'll also need one of those. I've found that my videogames look best after 4-7 beers. Odd how they get harder though. Would this be functional? Someone else mentioned that eBay adapters don't have sound ports (and it looks like this one doesn't) but could I just use the headphone jack instead? Funnily enough I find that my consumption of hops and barely correlates in an upward curve with my skill at games. Ninja Gaiden too hard? Toss back a few frothy brews and suddenly you feel a heck of a lot better about your gaming chops. It's amazing to me how much we can continue to squeeze out of these old consoles. New technology keeps pushing old tech to greater heights, I think that's pretty awesome. Now if only I could get sharp, crisp HDMI out of my Gamecube easily I would be a happy fellow. Edited by KreatorKat, Tue Feb 16, 2016 8:21 PM. Badass Consoles is also coming out with a Gamecube HDMI mod called GCVideo. It's very expensive, but in comparison to the price of component cables, that puts it in perspective. I like that solution a lot, especially since I can install it myself. Hopefully some pricing info is announced soon. I use the XRGB-mini almost exclusively now across a large range of computers and consoles from every region. The only real downside is that it doesn't support VGA, but otherwise there's nothing I would change about it. Despite the relatively high cost, with the right cables and adapters, it eliminates the muss and fuss of figuring out the best solutions for collectors with many different systems and lets you use a single high quality modern display instead of a handful of different ones of various vintage. Yeah, the promise of an external device that plugs into the digital output is very tempting. this is the route to go. the framemeister has been the best investment I've made for my retro setup. being able to save and load custom scaling options is outstanding. With a good RGB source the games really do look like rom quality pixels. 130XE with bad composite and s-video (chroma/luma) - Any ideas?